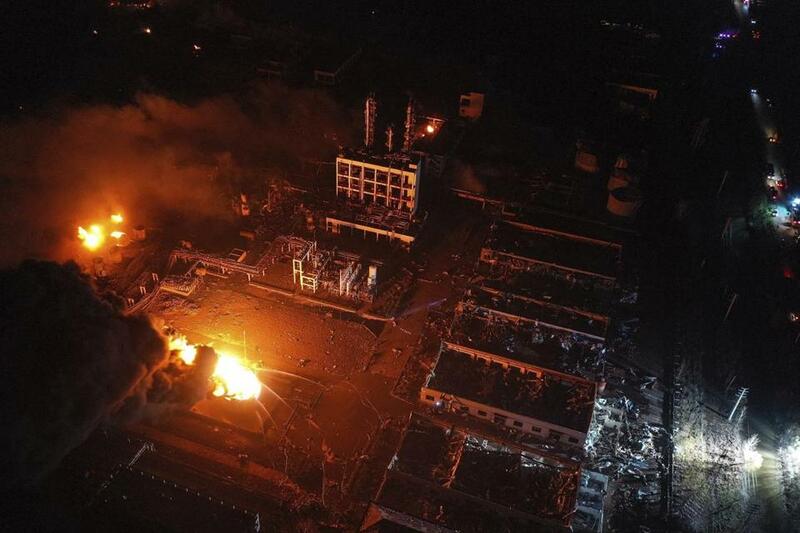 An aerial photo released by China’s official news agency showed fires burning at the site of a factory explosion in Yancheng. Thursday’s blast at the Tianjiayi Chemical plant in the city of Yancheng is China’s worst industrial accident in years. About 1,000 area residents were moved to safety as of Friday as a precaution against leaks and additional explosions, the city government said in a statement posted to its official microblog. Windows in buildings as far as about 3½ miles were blown out by the force of the blast. China experiences frequent industrial accidents despite orders from the central government to improve safety at factories, power plants, and mines.